1. Wash your hands with soap and water before handling raw ceramics. This is an important first step for everyone before you touch the ceramics, whether you are painting or helping others. Any grease (which could be from food, sweets, creams, baby wipes or from children putting their fingers in their mouths) may not show when you paint but may repel the glaze when it is dip-glazed. This can leave pits in the finished surface which may not easily be rectified. This should be remembered if you touch any food or drink whilst painting. 2. Choose an item to paint. We have a wide selection of bisque or biscuitware – pottery that has been fired but not glazed - ranging from plates, mugs and bowls to kitchen-ware, picture frames, animals, figurines and money boxes. 3. Prepare your ceramic by giving it a wipe over with a damp sponge. This is to remove any loose ceramic dust. It is preferable not to make the bisque very wet or each layer of paint will take much longer to dry. 4. Get creative and do some planning. Think of a design yourself or copy something you’ve seen elsewhere. You can draw an outli ne in felt-tipped pen first as the pen marks will disappear when your piece is fired. If you use stencils it is worth first drawing the shape through the stencil with the felt-tipped pen and then painting in the shape. This will prevent paint bleeding under the edge of the stencil and you will get more even coverage of paint. We do not give out pencils for drawing outlines as these can score the ceramic if pressed hard and also, some pencils seem to have a wax coating over the graphite which can then repel the glaze. Other techniques and paint finishes are possible - please ask for suggestions. These may not always be available, depending on the team on duty. There may be a small extra charge for some equipment or paints required. Everything you will need (paints, brushes, palettes, pencils, stamps, sponges, stencils etc) is provided and our friendly staff will be on hand to help you get started. Choose your colours - remember to check our colour guides as the glazing and firing process brightens up the colour of the paint you apply (see our FAQ). One coat of paint with a brush is fairly thin and almost translucent – you can still see the white of the bisque through. If you want a nice rich colour it is preferable to build up thinner layers of paint - apply one coat and let it dry, then a second coat and let it dry and then a third. Dark colours will cover light colours but light won't cover dark. For small children it often works well to give them the light colours first and then the darks (avoid the very dark ones like black, dark green and brown) if you want the light colours to show! For little ones it also works quite well to have a brush per colour to avoid having to keep washing brushes and introducing lots of water which weakens the colour. This also means you are more likely to get distinct colours on the finished ceramic rather than it ending up in varying shades of brown! Our pale pink, This Lil' Piggy, is very heat reactive and is not good for big areas. If you are covering a large area please use an alternative colour. 6. Writing and outlining may be easier and more effective with our "paint pens". 7. We then glaze and fire your masterpiece. Your ceramic is now ready for glazing and firing. 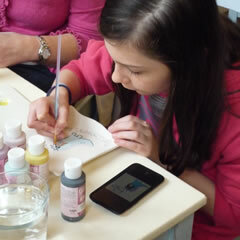 Once the ceramic and paint are dry your ceramic will be dipped in glaze which is then left to dry. Once dry, any drips etc are sanded and your ceramic will be loaded into the kiln. Very small items may need to stand straight on the shelf in which case all paint and glaze from the bottom will need to be removed (for example, letters and small hearts). Some items may be dry-footed – where the glaze is removed from the area that will be in contact with the kiln shelf. If this is not possible, the item will be mounted on stilts in the kiln – placed on small pins to prevent the glaze adhering your ceramic permanently to the shelf! If this is the case it will have razor-sharp stilt marks on the base which will have been ground down before collection. Your ceramic will be in our kiln for approximately 36 hours, having been heated for several hours at a temperature in excess of 1000°C! The glazing and firing process takes approximately a week or up to ten days in busy periods. Please ask if you need it sooner, we may be able to help. Your ceramic will be carefully wrapped and ready for you to take home and admire. All picture frame backs and bungs for money boxes will be with your ceramic on collection. Plate stands and hangers plus cork backing for tiles are also available to purchase. Any of the ceramics may be painted at home. You choose and pay for your ceramic plus a £20 deposit on a take-out paint box which contains 12 colours, brushes, palette, sponge and instructions. A black writing pen and nib may also be included on request. Take-out boxes must be returned after 7 days when the deposit will be refunded if the box is complete. When ceramics have been painted at home it cannot be guaranteed that they haven't been knocked so we do not accept responsibility for cracks appearing within ceramics during the firing process. 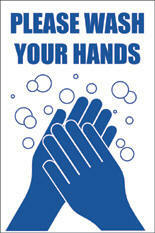 Please ensure hands are washed before painting at home and the ceramic is kept away from any grease. It should be thoroughly dry before being re-wrapped for return. Got paint on your clothes? Ceramic paints (glazes) are washable and will not stain clothes; they will wash out without pre-soaking.